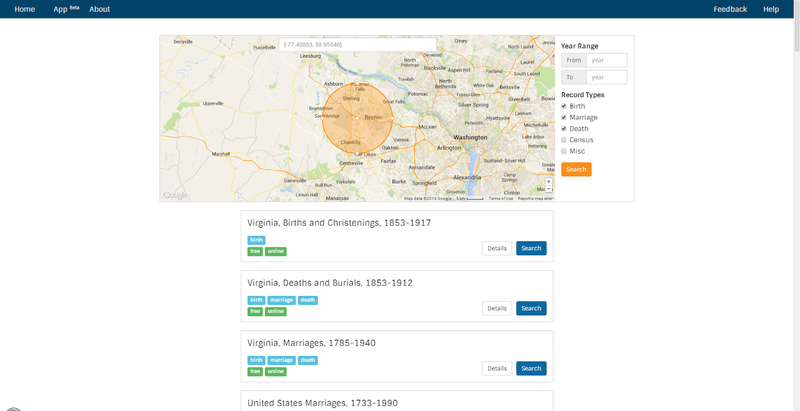 We've decided to create a new search experience on Find-A-Record. Let's look at the current search page. There are a few things about this that can be improved. The collection results are the most import piece of information, but they're relegated to a portion of the left side of the screen. The map, which is primarily used for searching, takes up most of the screen. The expanse of blue lines covering the US makes little sense to anybody but us. What it's showing is that the collection we hovered over was correctly geocoded to historical boundaries of the US (in this case 1767-1950). The search can be slow when searching on large complicated polygons like the US. The autocomplete for place search doesn't function very well. Here's a peek at the redesign we're working on. 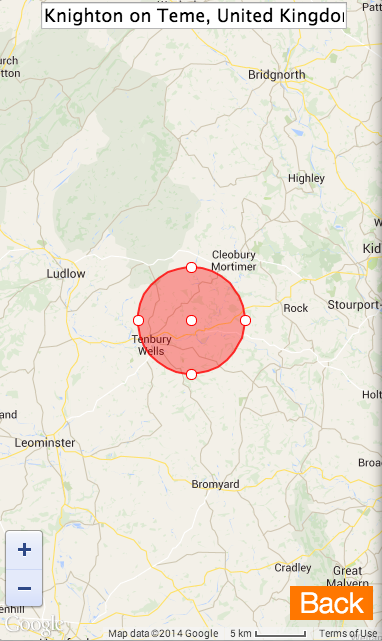 The map will only be used for choosing and displaying the search area. We have more real estate for displaying information about collections, which is what really matters. We will tell you what record types are included in the collection and whether it's free or behind a paywall and whether it's online or offline. The "Search" button will take you to an external web page that allows you to search the collection or gives you instructions on how to access it. The "Details" button will bring up a modal dialog that has more details about the collection, such as a description. 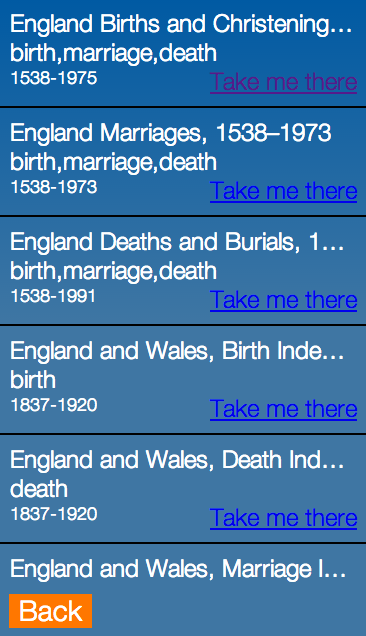 It will also allow you to explore all of the different boundaries which the collection was geocoded to. 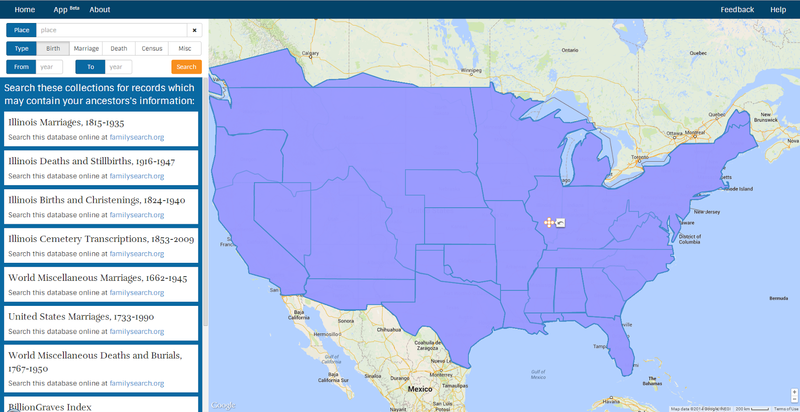 We are making the boundaries of a collection a little more difficult to access because most users don't care and because it significantly improves performance. We will no longer allow you to search on the borders of a country, state, or county. All searches will be radius searches. If you want to search an entire country you will have to expand the size of the circle to envelope it. This isn't perfect because it's impossible to cover all of Russia without getting China and other nearby countries, but Find-A-Record is most useful when optimized for local searches. We're also in the early stages of developing a mobile app.